Well the time has come for me to graduate. It is so hard to believe that just 3 and half years ago I was entering this space as a freshman. I truly could not be more pleased with my experience at UMD and my heart hurts when I think that it is now concluding. I have learned so much here and have been touched by so many amazing people; I am incredibly thankful. I think I could write pages giving people recommendations on what to do with their time at UMD, but I will try to keep it brief. Get involved. I’m serious. There is a club or student organization out there for literally every interest. What a convenient way to meet people and do what you love. You can also find on-campus jobs (the best are in Career & Internship Services) or join an intramural sport. Try new things. Now’s your time, people! Get out and do something you’ve always wanted to! Explore. The students who I’ve come into contact with that get off campus and explore the city of Duluth and the Northland feel much more connected to the community. We live in a beautiful place and it’s inspiring. There are so many hiking trails, boutiques, restaurants, etc. only 5-10 minutes from campus. Load up the car and head up to Gooseberry Falls or just spend an afternoon walking along the Lakewalk. That is how many of my fondest memories here were made. Appreciate your time. Soak it all up. It goes by so fast and before you know it you will be graduating. This is going to be an ironic statement after all of that, but something I’ve realized lately is that at some point in time you have to stop taking advice from people and do what you want to do. Take charge of your life and mold it into something that makes you happy every single day. This is the most important thing. You are the creator of your destiny and the measurer of your success. I am so excited for this next chapter in my life but am sad to be ending this one. This experience will forever be a part of me. A true thank you to every person in the Career & Internship Services office for being great mentors and coworkers. You are all fabulous people who I will miss very much. Yay Bulldogs! I did it! These are just a few of the many articles available. Good advice can take you a long ways and it is always good to get a diverse viewpoint on what can help you be successful. The link for this page is here. If you are interested in pages like these there are many more out there. LinkedIn has channels for every type of professional and topic issue. Some examples include: Finance and Banking, Leadership & Management, My Startup Story, and The Book That Changed Me. You can never gather enough advice or stop learning and this is a convenient way to get great information! Last school year I wrote about what the most successful people do before breakfast. I had read a book by Laura Vanderkam that spoke thoroughly on the topic and found it to be quite inspiring. There are many keys in making your entire day productive that start bright and early. A quick revisit of my previous blog posts would remind you to exercise, review your schedule, and allot time for personal and professional growth. So what do these successful people do after breakfast? Before or after breakfast, an important organization method is to create a “to-do” list. Making a clear list of things you need to do throughout the day will make it easy to prioritize the big items and the small ones. Instead of preoccupying your mind with these tasks, seeing them on paper will help you to think clearly. Upon getting to work on time (due to your time well spent before dawn), there are a variety of things you can do to have a high-functioning day. By creating a morning routine at the office you will have a consistent method of being productive. For some of the most successful, they begin by touching base with their boss or employees. If the people around you at the office aren’t productive, you won’t be either. Making sure your goals are aligned and are all working toward the same initiatives could take you a long way. Other business leaders take time to themselves to catch up on emails and other messages. Setting aside time to do this is important. If you do this throughout the day like in between meetings, may interrupt your workflow and productivity. Also, Remember that if you start your day off right, it will be your most productive time. Use it to tackle big projects or to hold your most important meetings. A study published in an American Psychological Association Journal, Emotion, stated that early birds feel healthier and happier than night owls. Begin each day at your best! I think that we all have our own mentors in life. Whether it be a family member, a previous teacher, or a coach, there are always people in life that we look up to and seek advice from. As college students we should also have people that inspire us and who we turn to for career-related knowledge. We can’t have a superhuman tendency and think that we can do everything on our own. Mentors can provide us with networking opportunities, a real-world perspective, constructive criticism, and much more. I have been reading a few articles on mentors and who the best ones to have are. One author, Kim Kaupe, talked about having four mentors so that your connections would be well-rounded. What were the four? Somebody inside the industry that knows you personally, somebody inside the industry that knows you as an acquaintance, somebody outside the industry that knows you personally, and somebody outside the industry that knows you as an acquaintance. I agree with this model and have set these goals for myself. I think it sets you up with a wide variety of coaches that will come from different places in your life. That being said, where does one find a mentor? Anywhere! A great place to make connections is at local networking events. This a place where you can find people generally interested in the same line of work as you. Furthermore, consider your family/relatives and your family friends. These people have known you personally and hopefully know a lot about your accomplishments. They will also not hold back when giving honest advice! You could start by attending UMD’s Alumni Networking Night on November 14th, at The Underground in the Duluth Depot. Make sure to RSVP by November 6th. Find all the details here. There are many places and ways to find mentors and they can be anybody. Start making these connections early so that the relationships will be more personal and meaningful. Recently I found a series of posts on LinkedIn that gives professionals a chance to describe how they hire. Many of the writers are CEO’s or business owners that are very influential. Although the page is primarily for recruiters or other hiring managers, a student can find a lot of valuable information when reading about what may make or break an interview and also what businesses are looking for. If you want to check it out, the channel is called “Influencers on How They Hire.” I particularly liked posts related to traits that employees were looking for; recurring words included passionate, confident, strategic, and adaptable. The posts were also encouraging when referencing the interview. They spoke about how outfits matter less than we think, the details of our stories are irrelevant in ways, but a glow in the eye signaling passion will land you a job. Tap into the brains of some of the most successful so that you can follow in their footsteps! Through Career & Internship Services I get to see dozens of resumes each week and have an opportunity to critique them. Our office provides pamphlets of advice that we have gathered from employers and the leading professionals. What format is best? What size font? What experiences should I highlight and how? But what if, after making all of the proper adjustments, your resume still isn’t getting through? Many students today are wondering how they aren’t getting even a phone call from an employer when they think they are the perfect candidate and their resume showed that. Well, the answer to your question may be your method of application, not your resume. Today many companies give you the option of applying online. Needless to say, it is fairly easy (yet time-consuming) to apply this way. In some scenarios, employers are receiving thousands of resumes. They then narrow the resumes down by selecting key words and experiences. So what is the key to locking down that first interview? Making a connection that isn’t anonymous online is crucial. By networking with professionals on LinkedIn or at job fairs, you increase the chances of your resume getting looked at, ten-fold. This connection is real. This is particularly relevant for those who are interested in a company that doesn’t necessary have any jobs posted. Again, by making that in-person connection, you have made some sort of impression. If it is a good one, your contact may put your resume at the top of the list or even let you in on the open positions that the company isn’t posting online. 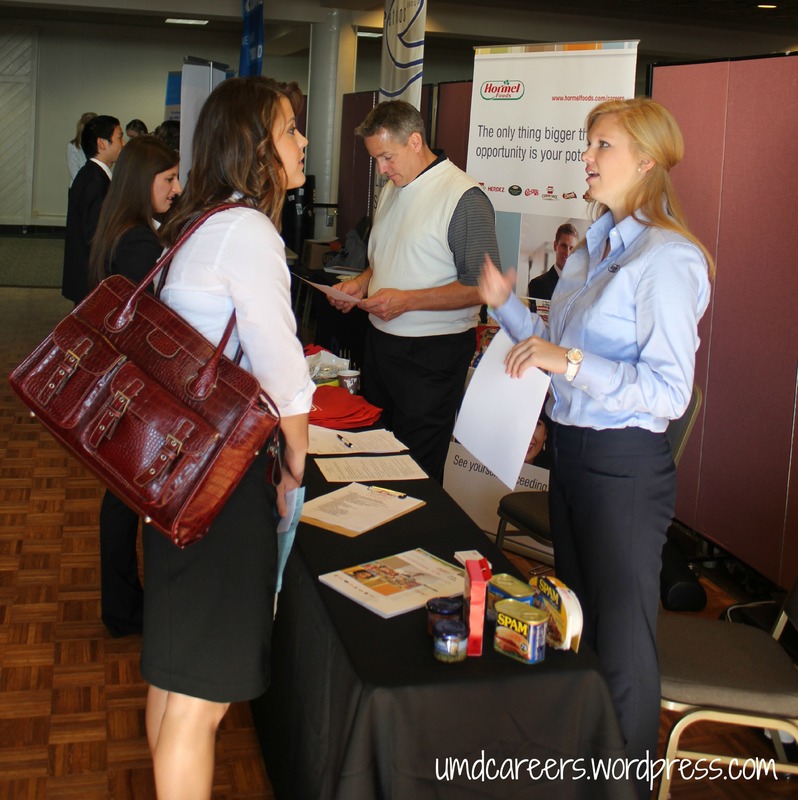 Earlier in the year, two Peer Educators from the Career Services office decided to talk to employers about their internship programs. Andrew and I made our way down to the U of M Job Fair in February. We were prepared with questions and equipped with iPads to collect the data. At the end of the day we had communicated with 30 different employers and gathered some great information. Each of the interactions were brief so we only had a chance to ask five questions. So what did we ask? In regards to obtaining the internship, we wanted to know what the top traits employers were looking for in their potential interns. Some of the key words we heard were: communication, passion, and leadership. When piecing together your resume, it is critical to highlight your experiences and expertise in these areas. 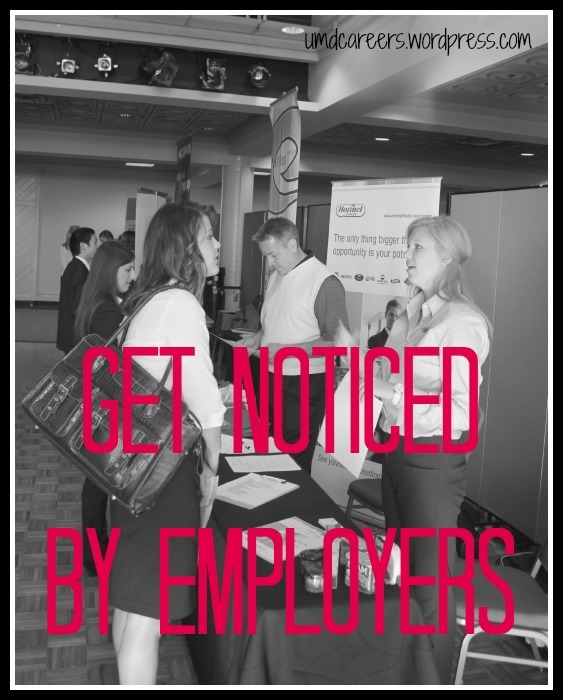 Employers will be sure to notice and it will help you to stand out from your peers. We also wanted to collect information about what an internship was like during the employment period. We asked how big of a contribution interns made to the business as well as what types of activities they usually did. Not surprisingly, we had a broad range of answers. Some of the most recurring activities were: paperwork, projects, and “real world” contributions. Before you accept an internship offer, ask your employer what your average day will look like. This will help lessen any shock of activities you weren’t expecting to do. Summarized above are some of our results. By this summer, the full report will be available online at www.d.umn.edu/careers. We are looking forward to continuing our research in the fall since we have now seen what works well and what doesn’t! We are generating new questions and will be attending a variety of different career fairs to gather a wide-range of information. Given the opportunity to ask an employer any question about internships, what would you want to know?